Last time I’ve talked about Munin, the one system monitoring tool I feel working well enough for me to actually bother to work with. Harsh words, I know, but the key to every solution is simplicity. And simple Munin is. Simple, but still powerful enough to do everything I would want it to do. The one problem I had with it is that the querying of remote nodes works over a custom TCP port (4949) which doesn’t work behind firewalls. There are some SSH tunneling solutions around, but what do you do if even SSH is no option because the remote access method provided to you relies on some kind of VPN technology or access token. Even if you could keep a long-running VPN connection, it’s a very performance intensive solution as it requires resources on the VPN gateway. But this point is moot anyways because nearly all VPNs terminate long running connections. If re-establishing the connection requires physical interaction, then you are basically done here. This is why I have created a neat little solution which tunnels the munin traffic over HTTP. 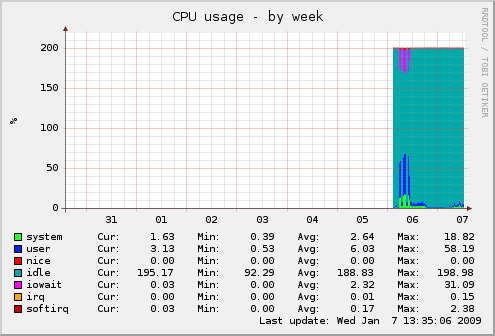 It works with a local proxy server your munin monitoring process will connect to and a little CGI-script on the remote end. This will cause multiple HTTP connections per query interval (the proxy uses Keep-Alive though so it’s not TCP connections we are talking about – it’s just hits in the access.log you’ll have to filter out somehow) because it’s impossible for a CGI script to keep the connection open and send data both ways – at least not if your server-side is running plain PHP which is the case in the setup I was designing this for. Aynways – the solution works flawlessly and helps me to monitor a server behind one hell of a firewall and behind a reverse proxy. You’ll find the code here (on GitHub as usual) and some explanation on how to use it is here. Licensed under the MIT license as usual. If you want to monitor runtime parameters of your machines, there are quite many tools available. But in the past, I’ve never been quite happy with any of them. Some didn’t work, others didn’t work right and some others worked ok but then stopped working all of a sudden. All of them were a pain to install and configure. Then, a few days ago, I found Munin. Munin is optimized for simplicity, which makes it work very, very well. And the reports actually look nice and readable which is a nice additional benefit. 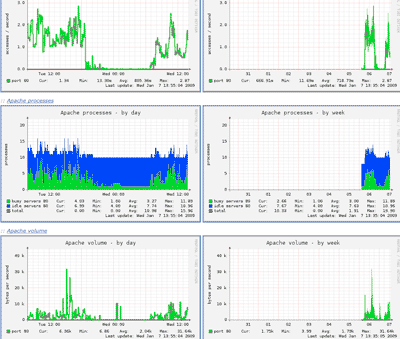 Like many other system monitoring solutions, Munin relies on custom plugins to access the various system parameters. Unlike other solutions though, the plugins are very easy to write, understand and debug which encourages you to write your own. Adding additional servers to be watched is a matter of configuring the node (as in “apt-get install munin-node”) and adding two lines to your master server configuration file. Adding another plugin for a new parameter to monitor is a matter of creating one symlink and restarting the node. On the first day after deployment the tool already proved useful in finding a misconfigured cronjob on on server which ran every minute for one hour every second hour instead of once per two hours. It’s very easy to install and configure. What good is an elaboration solution if you can never get it to work correctly? It looks very nicely and clean. If looking at the reports hurts the eyes, you don’t look at them or you don’t understand what they want to tell you. Because the architecture is so straight-forward, you can create customized counters in minutes which in the end provides you with a much better overview over what is going on. The one big drawback is that the master data collector needs to access the monitored servers on port 4949 which is not exactly firewall-friendly. Next time, we’ll learn how to work around that (and I don’t mean the usual ssh tunnel solution).